The TCA sent around a mailer to a lot of folks in South OC trying to drum up support for the toll road. The mailer is filled with lies about surfers trying to limit access to Trestles at the cost of traffic relief. Obviously improved coastal access is a major tenet of Surfrider's work. So get busy with your markers and tell them what you think!! I'm confused.. if the TCA doesn't have a toll road in San Clemente.. why have they given $2,672,000 to San Clemente in 2006 in "impact" fees.. that's the only year I checked.. but.. uh.. what is that about? Those "impact fees" go the other way, towards TCA. When new homes are built in San Clemente, and all of the affected cities, there is a fee of several thousand dollars tacked onto the price. This fee goes to pay the bills at the TCA, so that they can plan the destruction of San Onofre. It might be interesting to see if the TCA would be required to refund all of those fees when they finally give up on the 241-S. I agree. Let's stop the toll road. It's evil. I love traffic. I want more of it. 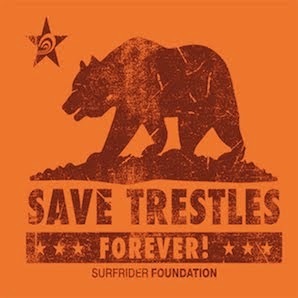 Can I jump on the emotional bandwagon and have a Save Trestles bumpersticker? That way, when I'm sitting in traffic on the 5 Freeway, everyone can see that I'm `Green'. I think Anonymous is a little confused about what it means to be green. There’s nothing green about sitting in traffic. Forget about the bumper sticker for your car and take the train—that’s what I do. Then you won’t have to sit in traffic anymore—and you won’t need another highway. Better yet, move closer to your work so that you can ride your bike. Then everyone will see that you’re green! Among the TCA's lies is that the toll road will alleviate traffic congestion. In fact, lanes of the I-5 would be closed for years during construction of the toll road, (creating the greatest bottleneck in the USA). Also, there's a little-known contract between the TCA and CalTrans - (get this!) if the toll road is built, there will be NO traffic improvements to the I-5! That's to force frustrated drivers off the I-5 and pay the toll to take the toll road. Pity the poor residents in San Clemente - the EIR says the pile drivers would be heard day and night during construction. I don't see how construction from the I-5 interchange would take years to build with lane closures when it would take only 3 years for the entire toll road to be built. Pile drivers may be heard at different locations during this 3 year period but could you imagine what you would see and hear if they decided to widen the I-5 instead. The non-compete clause that "b" refers too expires in 2020 and the toll road wouldn't be completed until after 2014. During this 6 year or less period Caltrans would not widen the I-5 unless they want to pay the TCA for lost toll revenue. Caltrans doesn't have the money to widen the I-5 anyway. This is the very reason why these new roads are built as toll facilities and not freeways. The non-compete clause doesn't affect I-5 improvements paid for by Measure M funds (example: new carpool lane) or any roads on OC Master Plan Of Arterial Highways (example: completion of La Pata).